rock formations | Barranquilla or Bust! La Piedra, as seen from the Embalse (Reservoir) Peñol-Guatapé. Medellín is perfect for day-tripping, with several great destinations within easy reach. But be forewarned — if you take one of the standard tours to El Peñón de Guatapé, you are probably in for a bit of exercise! Our driver dropped us off at the base of La Piedra de Peñol (the Rock of Peñol), as the freakishly pointy rock is also known, and then informed us that he’d wait while we ascended the 740 steps to the viewing platform on the summit. That we had a two-year-old on our hands did not seem to change our driver’s expectations. My husband, ever the good sport and fortunately boasting admirable upper body strength, was up for the challenge. I did a bit of toddler-hauling myself, and we made it to the top. The good news is that the climb was worth it. La Piedra is a natural rock formation with a total height of 2,135 meters above sea level. The prominently visible portion rises 200+ meters from the surrounding terrain. The locals told me it may have been a meteorite, though other sources state that it emerged as part of the region’s natural rock bed. Regardless, it’s no surprise that the rock was treated as sacred by the indigenous people that used to inhabit the area. La Piedra was first ascended in 1954 by local admirably-crazy guy (I have deemed him such) Luis Eduardo Villegas López and a couple of others. The masonry steps, squeezed into one of the Stone’s few natural crevices, were built in subsequent years by a visionary family that supposedly still maintains them today. Visible on the rock are two giant painted letters — a “G” and what looks like an “I”. 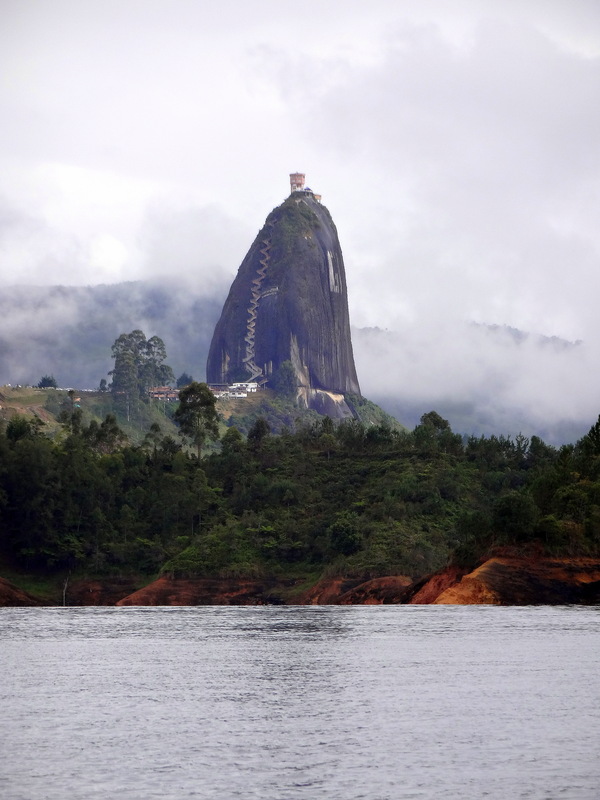 Legend has it that they’re remnants of a dispute between the towns of Guatapé and Peñol, between which the rock sits. The story is that Guatapé residents started painting their town’s name on the side of La Piedra until folks from Peñol mobilized to stop them. Only the almost-GU remains. Personally, I kind of feel for Peñol, seeing as how the original town of Viejo Peñol was flooded in 1978 and relocated to create the Peñol-Guatapé Reservoir. That being said, another account I read seems to imply that the letter-painting was halted because of La Piedra’s designation as a national monument by the Colombian government. I choose to believe the more fun mob story. In any case, El Peñon is definitely worth the pain in your calves and shakiness in your quads. Take a look and enjoy for yourself! Click on a photo to open a slideshow and see captions. It’s around 650 stairs to the top of the rock, but 740 to the top of the viewing platform built on the summit. The view from La Piedra got a lot more watery when the area was flooded to create the reservoir. Made it. Those of you who know me know those are my shoes. Marcello was more impressed with the gift shop than the view. Gio carried an extra-large 2 year-old up almost 740 steps (I carried him up a few!) and then back down. Never underestimate the descent. A bit of the painted letters “GI” are visible here.